Now you can conceal and access laundry in one easy motion with the CTOHB Tilt-Out Hamper. 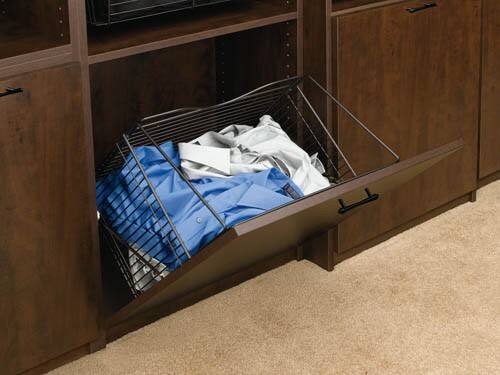 Simply door mount the basket rest to a bottom hinged cabinet for easy one step "Slide-In/Slide-Out" basket removal. The series is available in two sizes and three finishes, stylish chrome, satin nickel and oil rubbed bronze. Each is constructed with durable 6.6 mm wire and feature capacities of 1.7 bushels (55 Quarts) for the 16" wide unit, and 2.3 bushels (74 Quarts) for the large 21" unit.